I remember we were on a journey to one of the Arab countries-unfortunately-and arrived at one of the hotels; then we said, ”direct us to a restaurant”, and they directed us to what they claim was the best restaurant. We sat down and got the menu list and in it was alcohol and swine meat. So we said to the one who gave us the menu list: ”Are you a Muslim?” He said: ”Yes, I am a Muslim.” We said: ”How can you serve alcohol and swine meat to diners?” He said: ”This is my sustenance and from where would I eat then?” We said to him: ”your sustenance is with Allaah (Glorified and Exalted Be He). Indeed Allaah has guaranteed your sustenance and the doors of sustenance are open, so fear Allaah.” And we advised him in every way. The testimony (in this incident) is that some of the Muslims work in some of the hotels in which there is alcohol and they serve swine meat. This is in an Islamic land (in which) alcohol and swine meat are served, so how about those who travel to Europe? I believe that many of them may work in these hotels, serving swine meat to those who eat it amongst the sinful Muslims, the Muslim evil doers and the disbelievers. This is from the greatest affairs of wrongdoing and from the greatest of the major sins, and it may be a means to an evil end (in this life). 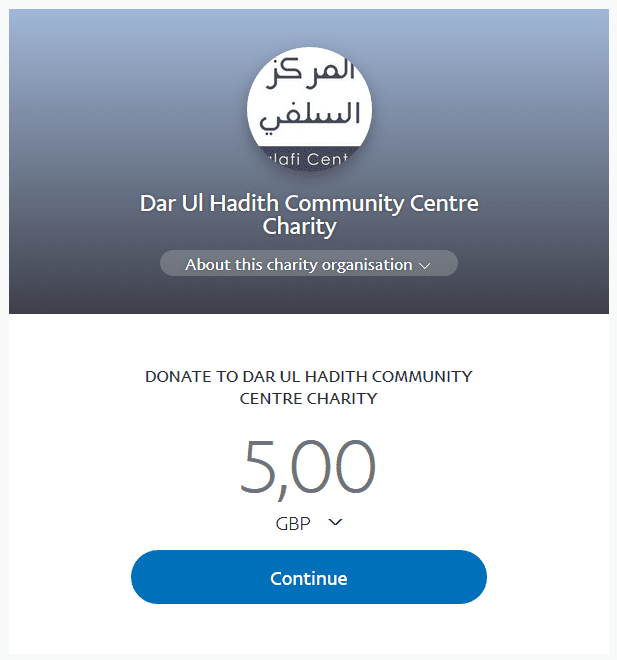 And Allaah’s protection is sought. Amongst the benefits of Naseehah (sincere advice) is safety from deceit. 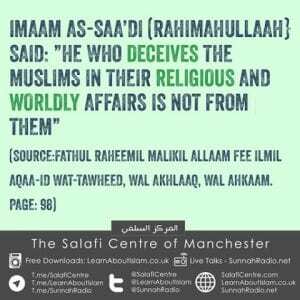 Indeed, he who deceives the Muslims in their Religious and Worldly Affairs is not from them. Deceit is from the most repugnant of ugly traits as it relates to (fulfilling) the rights of a relative and the non-relative, the (rights) of the one in opposition (to you) and the one in agreement. The Great Qur’aan calls to this quality, which is from the best of qualities. It (naseehah-sincere advice) is that which the Religion of Islaam is founded and upon which its structure is made to stand firm, and through which its superiority over everything else is manifested. Indeed, giving sincere advice to every individual is commended by the sharee-ah, the sound intellect and the natural disposition, and that which is in opposition to it is repulsive to the sharee-ah, the intellect and the natural disposition.